I was recently given a new hand mixer and so, naturally, the first thing I had to try it out on was homemade pesto. Normally I’m a bit of a purist when it comes to pesto. I could eat basil and pine nut pesto every day and never tire of it. It brings back very fond memories of inter-railing around Europe with my best friend after our A-levels. The only food we could really cook in our basic hostel kitchens was pasta and pesto from a jar. Washed down with a cheap bottle of plonk, we couldn’t have been happier. And then we ate fresh pesto in Italy and we were happier still. But as my husband isn’t much of a pesto fan, I have started to experiment with different variations. Wild garlic pesto was a big hit last year and I look forward to picking some again from the local hedgerows when spring finally decides to turn up here in Somerset. 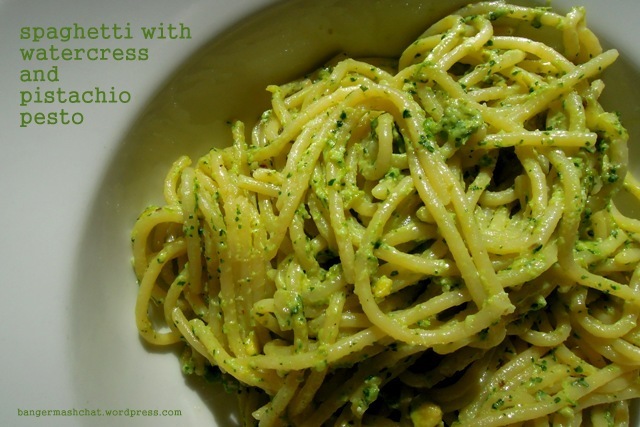 One of my favourite food bloggers is Louisa at Chez Foti who happens to be a bit of a pesto aficionado. I love the look of her stilton, walnut and parsley pesto and will be trying it soon. In this same blog post Louisa helpfully listed a whole menu of ideas for anyone wanting to dabble in a little pesto experimentation. One of her suggestions was watercress, which is a particular favourite ingredient of mine. 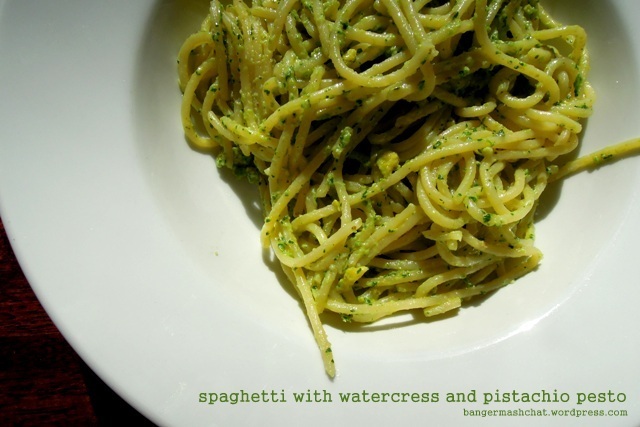 And so I came up with this recipe for watercress and pistachio pesto. I thought it might be a little peppery for the children but that wasn’t an issue at all. They wolfed it down and came back for more. A definite success. Bear in mind that if you do add the Ricotta at the end, you’ll need to use the pesto within a couple of days. If you leave it out, the pesto will keep in a glass jar in the fridge for a couple of weeks. In a blender, process the watercress, salt, and garlic until well chopped. Add the Parmesan, pistachio nuts and olive oil and blend until fairly smooth and creamy. Scrape into a bowl and fold in the Ricotta cheese. Serve with pasta of your choice. Personally I always go for spaghetti with pesto. If you have featured a pesto recipe on your blog, please feel free to include a URL in the comments below and I’ll be more than happy to link up to it! I am entering this recipe in the #TuscanyNowCookOff. It might not be the most authentically Italian pesto, but it might possibly get through on creativity! Oh thanks my lovely for my Pesto Aficionado mention!!! 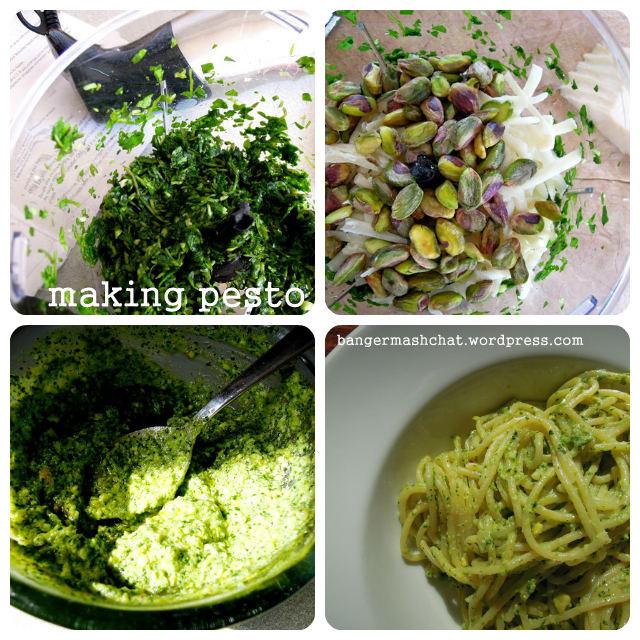 In fact I have a new pesto themed blog coming shortly, just can’t seem to get enough of this goodly green stuff. And just when I thought I’d tried almost all permutations you come up with Watercress & Pistachio – both of which I haven’t pestoed up yet!. And I now feel compelled to try, sounds and looks wonderful. Loving the addition of ricotta too, occasionally I add a dollop of creme fraiche at the end, but I’m betting ricotta is sublime. That sounds SO gorgeous. I would never have thought to use pistachios nor ricotta. I am definitely bookmarking this recipe to try. ooh this looks so nice. I used to hate watercress & my Mum used to eat it by the bucketload….funny how your tastes change as you get older as I now find myself eating watercress sandwiches with my daughter looking on & saying ‘err how can you eat THAT!’…just as I used to. I’ve never tried a sandwich with just watercress but it actually sounds rather delicious. Will be giving it a go. And I wouldn’t be surprised if I get the same reaction from my youngest. She can’t get her head around eating ‘leaves’!